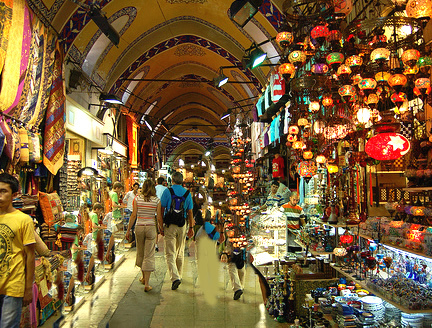 Doug French - The Grand Bazaar in Istanbul has been a beehive of mutually beneficial exchanges for 550 years. Americans may think of Rodeo Drive or Madison Avenue when they think shopping, but while everyone pays the sticker price in America, price tags are rare at the Grand Bazaar. Show any interest in an item at one of the 4,300 shops in the bazaar and the proprietor or store employee will engage you immediately. If English is your language and he doesn't speak it, in seconds someone will appear who does. This shopping experience isn't anything like a leisurely stroll through Walmart, where you only occasionally spot blue-smock- and big-button-wearing employees. With thousands of choices, shopkeepers try a variety of come-ons to get passing shoppers to look at their wares. Some make you feel foolish: "You look lost, come in my shop." Others make you laugh: "Let me sell you something you don't need," or "Cheaper than Walmart!" And then there's the appeal to the shopper's ego: "You look like a professional rug buyer. Come and see my selection."